Being green is not just about recycling, reducing product waste, and innovating renewable energies, it's about investing in the communities that are committed to greater harmony between us mere mortals and Mother Earth. Yes, humans, that means a bit of vanity is okay when it involves harnessing our powers to cultivate karmic well-being. This social well-being, in fact, is a key component in the Three Pillars of Sustainable Development. One way to do so is through the support of minority-owned businesses. Obvi, we have much to do to rectify the past harms embedded in the history of many nations. Thus the uproar over the recent H&M ad showing a black child wearing a "Coolest Monkey in the Jungle" hoodie. While yogis (and his mum) know that "monkey" may be a non-racial description of a young, or less developed mind, the infantilization (and dehumanization) of black people in the United States, where in 2016 there were reportedly 468 stores bearing the Swedish company's name, has sowed seeds of intense depression and fear among all races. We have to be more woke to the pain to heal it. One small step for UWM was to sit with Ms. Dominique Drakeford, fashionista and environmental educator to talk about the ad and what gear we need to take our collective humanity to new and fly heights. UWM: Dom, love, what did you think of the H&M ad? Dominique:H&M’s racially insensitive ad is nothing new. Corporations have been exploiting black bodies and mass media has been dehumanizing black communities for years.Whether it was the controversial Gap Kids ad or the recent tone deaf Dove Facebook ad, large corporations have been and will continue to be racially impervious. Unless we do something about it, right? For those of us who feel exasperated, what may we do? There doesn’t need to be very much wasted conversation on the topic in all honesty.It’s beautiful that social media’s uproar can create a unified voice of dissatisfaction. However, as far as I’m concerned, corporations have marketing geniuses who are conditioned to manipulate black and brown communities to spend money on companies that don’t give a crap about them. That's why The Weeknd and G-Eazy ended their partnerships with H&M behind this mess. Girl! Perhaps we take a page from our ancestor’s book and become investors. Invest our time, money and energy on supporting brands for your community and by your community (#FUBU). What are some brands that kids like Rachel Dolezal's son may wear? 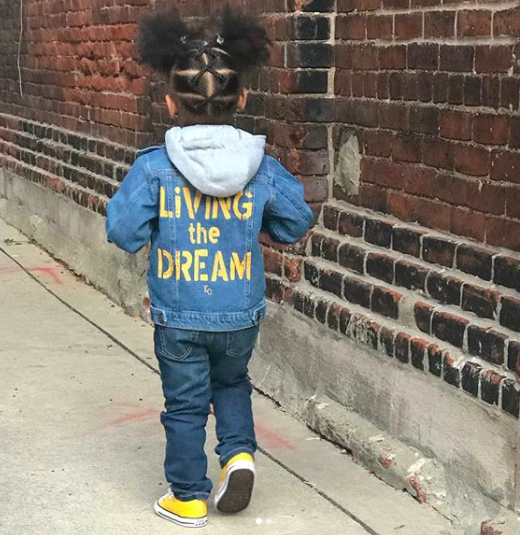 Some black-owned kids brands to buy instead of H&M include Coco’Pie Clothing; KaAn’s Designs; Yinibini Baby, which uses organic cotton and non-toxic water-based inks; and Mixed Up Clothing, a line inspired by cultures from around the world. Along with these brands, I’m sure if you do a little research and networking, you’ll find makers in your local community as well as some amazing designers via Instagram. Yaaaaas! We love the "Livin The Dream" denim jacket by the hubby and wife team of KaAn (see pic above). It's something the majority may stunt in without any side eye. And 11-year-old Kheris Roger's line, Flexin' in My Complexion. She's the youngest designer ever to debut at New York Fashion Week! Shopping small and supporting black indie brands is one of the best things outraged consumers can do to fight socially and culturally unethical corporations. Where you invest your dollar, not only is a political stance, but it sends a powerful message to your kids that will resonate with them as they grow … creating values instead of being a puppet of exploitation. Photo courtesy of KaAn's Design's IG. Dominique Drakeford is an environmental educator, creative director and community advocate who works in so many different spheres to inspire ecological, cultural, and social change. Having worked with a myriad of companies and organizations such as Donna Karan’s Urban Zen and Rosario Dawson’s Studio 189, her work has been about changing mainstream narratives on what sustainability looks like in practice while especially giving a voice to women of color. As a fashion-forward activist, she has appeared on the cover of Ethical Style Journal, written for numerous publications and partners with global luxe sustainable fashion brands. Additionally, she is the editor in chief of Melanin And Sustainable Style (MelaninASS) -- an evolutionary platform that discusses the issues and celebrates the success of communities of color in sustainable fashion, green beauty and wellness spaces. It’s a content-rich, vibrant, and communal space that elevates sustainable development, social innovation and holistic living. MelaninASS features exclusive interviews and creates original editorial content in collaboration with sustainable fashion designers and natural beauty brands.